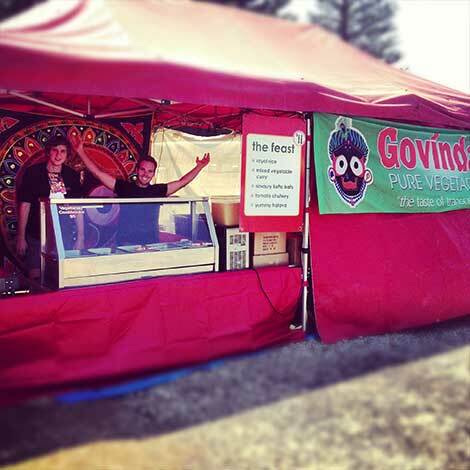 New Govardhana’s highly efficient 3 man catering team currently includes Krishna Gana dasa, Bhakta Theo and Bhakta Ben. Requested by The Queensland Folk Federation to distribute Krishna cuisine at The Wallaby Creek Festival for the third year, our intrepid crew set off for the tiny village of Roseville, which is a 40 minute drive south of Cooktown. This annual 3 day event attracts up to 4,000 alternative people interested in the workshops on solar power and bio-dynamics. Many attendees are prasadam addicts, who make a beeline for the Krishna tent as soon as it opens. A serious glitch occurred on the very first morning with the breakdown of the all-important, electric vegetable cutting machine, which does the work of 2 people. Already running late and wondering how they could catch up, our team was more than relieved when 2 enthusiastic would-be volunteers asked if there was anything they could do to help. Over the next few days, by Krishna’s grace, another half dozen people manifested to assist in the cut-up, and our grateful crew distributed a total 1,000 plates by the end of the festival. Many favourable people come back each year and the book table is reporting excellent sales. Two more festivals are lined up for The Tablelands at the end of October and the beginning of November.